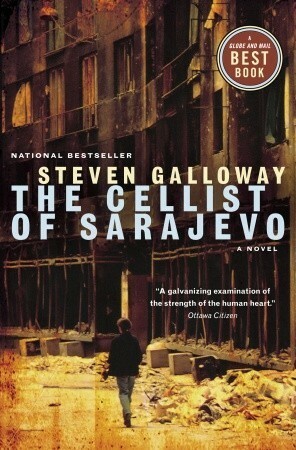 Exquisite and profoundly moving, The Cellist of Sarajevo shows how life under siege creates impossible moral choices. It is a story about survival, about the temptation to hate and refusal to do so, about the persistence of the human spirit in a time of fear and suffering. Sometimes the blurb on the inside flap or back cover of a book sums up the book so perfectly, that I would rather include it than try to think of a better way to say it myself. 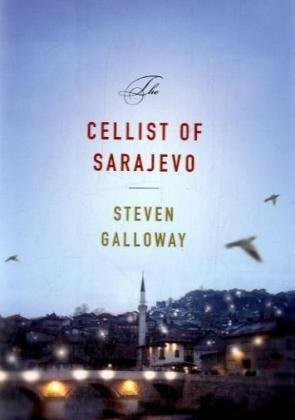 The Cellist of Sarajevo is a beautifully written tribute to the people of Sarajevo. The book tells of three different people living and surviving in Sarajevo during the siege, They each have their own story, and are affected by the war, and struggle to come to terms with it in different ways. The cellist’s story, itself, is a thread that runs through the background of everyone else’s story. After a bomb kills twenty-two people who are standing in line for bread, the cellist vows to play music in the street where they fell for twenty-two days, in memory of the ones who were killed. That something could be almost erased from existence in the landscape of a ruined city, and then rebuilt until it is new and worthwhile, gives him hope. A hope that, now, is one of a limited number of things remaining for the besieged citizens of Sarajevo and that, for many, dwindles each day. Kenan is a husband and a father. His family hides in their apartment where there is no running water, little food, and only periodical electricity. He and his wife try to remain optimistic for the children. He wonders how this war will affect them, and he wonders if they will all survive it. Every four days, despite his terror, Kenan must go out into the dangerous streets to collect water for his family. Muffled sounds seep out of the apartment, and he worries that one of the children might come to the door. They must not see him like this. They must not know how afraid he is, how useless he is, how powerless he has become. If he doesn’t return home today he doesn’t want them to remember him sitting on the landing, shaking like a wet and frightened dog. He cannot collapse, though, because his children look to him to reassure them that everything will be fine, that the war will end, that they will all survive. There are times when he doesn’t know how he manages not to evaporate, how his clothes don’t fall to the floor, emptied of what little substance he was filling them with. Fear has paralyzed him as surely as a bullet to the spine, and he simply doesn’t have what it takes to go back. Shame soaks through him. All he wants now is to go home and crawl into bed. Dragan is a 64-year-old man, who has sent his wife and son out of the city to keep them safe and is now living with his sister’s family. He has been wandering the city like a ghost, not really living. He strongly grieves the Sarajevo he remembers and desperately wants it back. He wonders how to keep the spirit of the city alive, to keep it from falling like the buildings. Every day the Sarajevo he thinks he remembers slips away from him a little at a time, like water cupped in the palms of his hands, and when it’s gone he wonders what will be left. He isn’t sure what it will be like to live without remembering how life used to be, what it was like to live in a beautiful city. When the war first started he tried to fight the loss of the city, tried to keep what he could intact. When he looked at a building, he tried to see it as it had once been, and when he looked at someone he knew, he tried to ignore the changes in their appearance and behaviour. But as time went on he began to see things as they now were, and then one day he knew that he was no longer fighting the city’s disappearance, even in his mind. What he saw around him was his only reality. He wonders what they think about, up there in the safety of their hills. Do they wish for this war to be over? Are they happy when they hit something, or is it enough to frighten people, to watch them run for their lives? Do they feel remorse when they go home and look at their children, or are they pleased, thinking they have done a great service for future generations? If this city is to die, it won’t be because of the men on the hills, it will be because of the people in the valley. When they’re content to live with death, to become what the men on the hills want them to be, then Sarajevo will die. Arrow has given herself a new name to separate her from her old self. When the war is over, she hopes she will be able to leave her new name and life behind to go back to her old one. After the war began, she became angry at the men who were trying to destroy her city and her life. She became a sniper, and excelled at it. She kills men with the knowledge that she saves lives in doing so, but she wonders about the nature of hate. Where do you draw the line? She hopes that the girls, and the rest of the city, hate the men on the hills for the same reason she does. Because they made her hate. They started a war, saying that the people of Sarajevo hated each other, and the people fought back, saying they didn’t, that they were a city without hatred. But then the men on the hills started to kill and mutilate and destroy. And little by little they got what they wanted, a victory as clear as it would be if they could drive their tanks through the town. They made her, and people like her, hate them. Arrow let the slow pulse of the vibrating strings flood into her. She felt the lament raise a lump in her throat, fought back tears…. She didn’t have to be filled with hatred. The music demanded that she remember this, that she know to a certainty that the world still held the capacity for goodness. The notes were proof of that. 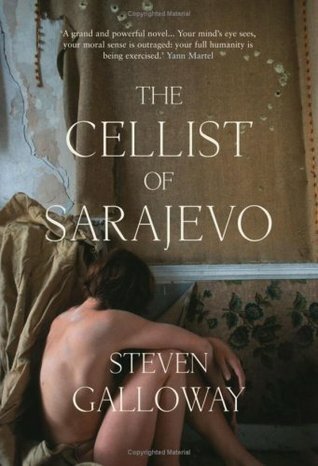 The Cellist of Sarajevo has become an international bestseller, winning the 2009 Evergreen Award, the George Ryga Award for Social Awareness in Literature, and the Borders Original Voices Award. I loved this book, and highly recommend it to everyone. I can’t wait to read another book by Steven Galloway, although I suspect I have already read his best. Has anyone experienced living in a city under siege? What would it be like to go out everyday, knowing it could be your last? What do you think about the use of art, music, etc. to keep people’s hopes and spirits alive? Great review! I was going to read this book as part of the City of Toronto’s city-wide reading for April, but have too many other books on the go this month. I think Steven Galloway just released a new book. Yes, he just released one called The Confabulist. All of his books look good to me, but I think the next one I read would be either Ascension or Finnie Walsh. This sounds wonderful! I lived in Belfast in the early 1990’s when the Troubles were still an everyday reality and honestly, you just get on with things. What else is there to do. I wouldn’t in anyway compare it to the seige in Sarajevo, but it is something that is there in the dark corner of the everyday. Do you know of any books written about the Troubles in Belfast? There’s a fabulous novel from the late 80’s called Ripley Bogle by Robert McLiam Wilson, it’s a first person narrative told by a homeless man now living in London who is looking back on his life growing up in the worst of the troubles. I also love Cal by Bernard MacLaverty who is a stunning writer and the movie version of it isn’t half bad either! Thanks for the suggestions, Cathy! I’ve been planning to read this book this year, but I’ll move it towards the top of the pile now. It sounds very intriguing. I hope you like it as much as I did! It’s quick to read, too, partly because it’s hard to put down. This book sounds excellent. I’m reminded a little of A Constellation of Vital Phenomena, which came out last year. Have you read that one? I liked the passages you picked out, too — great review! One more for the TR-list . . . Thanks! I did love this one. I haven’t read A Constellation of Vital Phenomena yet, but it has been on my list for a long time. My library doesn’t have it (it doesn’t have a lot of books I’ve wanted to read), so when I’m ready to read it I have to put in a request to get it from another library system. I have done this many times, but it still usually causes me to put off certain books that I might otherwise have read sooner. Well, if it was your favourite, then maybe I should think about getting that request in! I just read your review. One thing that struck me in the novel that you talked about in your review was the dangerous act of crossing the street. I can’t imagine what it must be like to stand at the intersection for 2 hours until feeling like it might be a good time to cross. That maybe I won’t get shot in the head if I wait 10 more minutes, or until the next person goes by and doesn’t get shot at. We really are so fortunate here. I think you should give this one a try. Even though it is set in a city under siege and describes what it is like, I didn’t find the book at all depressing. There is a sense of hope, and love for their city. I agree! Where would we be without the ability to express ourselves in some way? And see others express themselves? This book sounds intense! Adding it to my list! I hadn’t even thought of that. Thanks for the link! You’re very welcome! I’ve been obsessed with that performance for as long as I can remember. I don’t know if I saw it when it happened, I don’t remember it, but the beauty of it has always stuck with me. Imagine how beautiful it must have sounded to the people of Sarajevo. Wonderful review – I’m so excited about his new book The Confabulist. I’m excited about reading all his other books when I get a chance. Thanks for stopping by, so that I could go check out your blog! Hi Naomi! Thought I would share with you that the Toronto Public Library is hosting an online chat with Steven Galloway tomorrow night. Talk soon! Loved this review! I love that you included the different covers. They’re all so beautiful. I’ve been meaning to read The Cellist of Sarajevo but I might just jump in and read The Confabulist first!